Evangelicalism appeared as a new pattern of Christian devotion at a moment in history when the foundations of Anglo-American society were shifting. 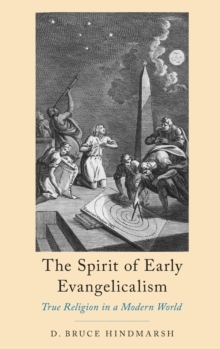 The Spirit of Early Evangelicalism sheds new light on the nature of evangelical religion by locating its rise with reference to major movements of the 18th century, including Modernity, the Scientific Revolution, and the Enlightenment. Hindmarsh draws on a wide range of sources to make meaningful connectionsbetween the evangelical awakening and the history of science, law, art, and literature. Each of these fields placed a profound emphasis on nature and the authority of natural knowledge, and democratic debate was encouraged in the public sphere. In this context, evangelicals forcefully pressed their agenda for"true religion," believing it was still possible to experience "the life of God in the soul of man." The results were dramatic and disruptive. This book presents a fresh perspective and new research on the religious thought of leading evangelical figures such as John and Charles Wesley, George Whitefield, and Jonathan Edwards. It also traces the significance of evangelical spirituality for non-elites across multiple genres. From the scribbled marginalia of lay Methodists and the poetry of an African-American laywoman to the visual culture of grand manner portraits, lunar drawings, and satirical prints, Hindmarsh traces the meaning ofevangelical devotion in a rich variety of contexts. By presenting devotion, culture, and ideas together, The Spirit of Early Evangelicalism shows the advent of evangelicalism to be a significant new episode in the history of Christian spirituality.